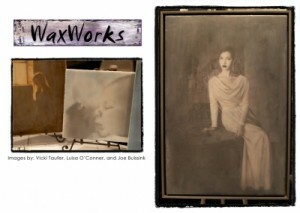 The Waxworks process combines your photographic print, which will be mounted a wooden panel with archival glue with a surface treatment that combines natural beeswax and an oil paint medium. The final result is a painterly effect that lies on top of the wax coating creating a soft dreamy effect. Seeing it online does not do it justice! We have seen these at the last few photography shows we have attended and each time it is like we are seeing it for the first time. The pieces can be a little bit pricey, but they are handcrafted and we believe worth every penny. These images will become cherished family heirlooms that will stand the test of time. They have a classic feel that will stand the test of time. For more information on the process and the artist, please visit WaxWorks Photo. If my sources are correct, you can get a 16" x 20" Waxwork piece for only $150, that is 40% off the regular retail, but the deal ends this Friday! If you have had the pleasure of seeing one of these pieces before, please leave a comment and let others know what you think!